Is married ... wife's name is Johanna ... the couple has three sons, Alexander Jr., Johander and Axe. Played in 41 games for MIL, batting .177/.203/.230...Hit lone HR of the season, April 7 vs. ARI...Had season-high 3H and 3R, April 26 @LAD. Batted .259 with 4 HR and 15 RBI in 24 games with Milwaukee ... made 24 starts at shortstop. Was placed on the 15-day disabled list on 5/6 with a torn ACL in his right knee ... suffered the injury on 5/5 at San Francisco while sliding on a stolen base. Underwent season-ending surgery on 5/17, performed by Dr. William Raasch. Was transferred to the 60-day disabled list on 5/23. His 15 RBI ranked second on the team at the time of his injury (Ryan Braun-18) and second among National League shortstops (Starlin Castro, ChC-16). His vesting option for 2013 was not exercised ... was signed back as a free agent on 2/6/13. Split the 2010 campaign between the Toronto Blue Jays and Braves hitting .250 with 42 doubles, 23 homeruns and 88 RBI...Was acquired by the Braves from the Blue Jays as part of a five-player trade on 7/15. In addition toGonzalez the Braves acquired left-handed minor-league pitcher Tim Collins and minor-league SS TylerPastornicky in exchange for shortstop Yunel Escobar and left-handed pitcher Jo-Jo Reyes...Played in 85 games for the Blue Jays and hit .259 with 25 doubles, 17 home runs and 50 RBI before beingtraded to the Braves on 7/14...At the time of the trade, ranked tied for fifth in the American League with 43 extra-base hits...In his first nine games with Atlanta (7/15-24), hit .361 (13-for-36)...Led all major league shortstops in doubles (42), was second in RBI (88) and third in home runs (23)...Ranked fourth among NL shortstops with a .974 fielding percentage (minimum 300 chances) in the secondhalf of the season...Appeared in his third career postseason. Started all four Division Series games at shortstop.Went 3-for-15(.200) with one double and two RBI...Clubbed a three-run walk-off homer in the 12th inning on 9/11 vs. STL. It was his first walk-off homer of theseason and his first since 9/26/98 vs. PHI...Had four hits 7/22 vs. SD, matching his career high (eight times)...Hit safely in 10 consecutive games, 8/18-28: .368 (14-for-38) with five doubles and eight RBI...Over a 25-game stretch, 8/18-9-13, hit .309 (30-for-97) with eight doubles, two home runs and 17 RBI...Recorded his eighth career two-homer game 4/30 at OAK. Split the season between Cincinnati and Boston, his first Major League action since 2007 after missing allof 2008 with a compression fracture of his left knee... Hit .210 (51-for-243) with 3 home runs and 26 RBI in 68 games forthe Reds... Was dealt to the Red Sox along with cash considerations on Aug. 14 for minor league infielder Kris Negron...LIKES BEANTOWN: Hit .284 (42-for-148) with 5 home runs and 15 RBI in 44 games for Boston... Was his 2nd stint for theRed Sox after appearing in 111 games for the club in 2006... FLASH THE LEATHER: Made only seven errors in 425 totalchances at shortstop for a fielding percentage of .984, 6th among qualifying Major Leaguers... Appeared at shortstop forthe Red Sox in 44 of the club's final 47 games (43 starts), posting a .994 (1 E/159 TC) fielding percentage in those contests...In 115 games without Gonzalez, the Red Sox were 8th in the A.L. with a .984 fielding percentage... From August 15onward the Sox led the Majors with a .991 mark... Reached 20 doubles for the 8th time in his career... Combined to hit .291(53-for-182) over his final 54 games of the season after snapping an 0-for-20 slide with a solo home run off Randy Wellson Aug. 3 vs. the Cubs... Was hitless in his first 17 at-bats to begin the season and posted a .171 (14-for-82) clip throughhis first 23 games of 2009... Went 14-for-43 (.326) over an 11-game span from May 19-31, raising his season averagefrom .171 to .224 in that time... Was on Cincinnati's 15-day disabled list from June 20-July 23 and underwent arthroscopicsurgery to remove 4 loose bodies from his right elbow on June 22. Missed the entire season with a compression fracture of his left knee...on 7/7 had seasonendingmicro fracture surgery (Dr. Timothy Kremchek)...didn't play in a spring training game or in a regularseasongame...on 3/31 went on the disabled list and remained there the rest of the championship season...on 5/28 was transfered to the 60-day DL to make room on the roster for IF Andy Phillips. In his first season with the Reds tied for the club lead in doubles (27)...missed 28g while onthe bereavement list 3 times (4/13-4/16, 7/14-7/20, 8/15-8/21) and the restricted list once (7/21-7/30)...wasbothered late in the season by a bone bruise in his left knee and didn't make a start after 9/12...appeared in5 of the Reds' last 17g of the season, all as a pinch hitter (1-5)...hit safely in 20 of his 24 previous starts priorto that knee injury (31-86, .360, 3hr, 14 rbi)...led the club with 52 starts batting seventh in the order and 98starts at SS...from 4/23-4/29 shared with Phi's Chase Utley the National League Player of the Week Award(.520, 3hr, 6rbi, 9r)...in only 6g that week led the the NL in hits (13), HR (3), total bases (26) and sluggingpercentage (1.040)...a team-high 3 times hit the second of back-to-back HR (5/1 at Hou w/ Ken Griffey Jr.,5/7 vs Hou w/ Adam Dunn, 5/26 vs Pit w/ Edwin Encarnacion)...in April hit .329 (3hr, 10rbi)...on 4/24 at StLproduced 4hits, 2hr, 5rbi, 11 total bases and 4 runs scored...tied career single-game highs in homers, RBIand hits and established new career highs in runs scored and total bases...the 11tb and 4r were the mostby a Reds batter in a game all season...on 5/23 vs Wsh committed his only 2-error game since 8/16/04 atLAD...on 5/27 vs Pit hit his 100th career HR (off Tony Armas Jr.)...in the 12-inning, 1-0 victory vs Cle on 6/10drove in the game's only run with a single off Adam Miller...from 6/16-6/18 committed an error in 3 consecutivegames for only the fourth time in his career (9/4-9/7, 1999; 4/27-4/29, 2001; 4/26-4/30, 2005)...on 8/2 at Wshhomered off Mike Bacsik in his first plate appearance since 7/13 following a stint on the bereavement andthen restricted list...on 8/25 vs Fla wore #13 in honor of Dave Concepcion, whose jersey was retired duringpre-game ceremonies that night. For the Red Sox committed a career-low 7 errors (111g, 475tc) and led all American Leagueshortstops with a club-record .985 fielding percentage...his 57-game errorless streak from 4/11-6/30, 2006 alsowas a record for Red Sox shortstops (Rico Petrocelli, 48g, 9/25/68-5/30/69)...the first 3 months of the seasoncommitted just 2 errors in 243 total chances (.992)...from 8/19-9/2 was on the disabled list with a strained rightoblique muscle...on 8/3 was hitting a season-best .291 but then was bothered by the oblique injury and hit .122(10-82) in his last 25g of the season...went 1-for-24 in his first 8g coming off the DL, including a season-high0-for-22 skid (8/11-9/4)...from 6/17-7/3 produced a season-high 12-game hitting streak (.391)...on 9/14 atBal made his 1,000th career appearance...on 6/27 and 6/28 vs NYM homered in consecutive games for theseventh time in his career...those homers began a streak in which he hit 6hr in 26g from 6/27-8/1...followingthe season played for Leones del Caracas in the Dominican Winter League (11g, .293, 1hr, 3rbi, 2sb). For the Marlins produced at least 30 doubles for the third straight season and for the fourth time in 5years...his .319 on-base percentage was the highest of his career...in 124 starts at shortstop posted a .974fielding percentage...his career-best 17-game hitting streak (.302) from 6/9-6/27 was the longest by a Marlinsbatter all season and ranked T5th in the National League...also recorded a pair of 11-game hitting streaks,from 5/14-5/26 (.472) and from 6/29-7/9 (.326)...hit .300 in both May and July...in September was botheredby a bone bruise on his right elbow and spent the latter part of the season as a pinch runner...in the offseasonhelped lead Venezuela to the 2006 Caribbean Series championship, its first since 1989...scored the winningrun in the bottom of the ninth inning of the decisive game vs the Dominican Republic...earlier in that seriesproduced a walkoff homer to lead Venezuela to an 11-9 victory vs the Dominican Republic. With a career-high 23hr and 79rbi led allNational League shortstops and established Marlinsclub records for that position...also set career bestswith 67 runs scored and 159 apps...became thefirst Marlins middle infielder in club history to reach20 homers...played in 1,351.2 of Florida's 1,439.0innings (93.9%)...posted a .976 fielding percentage...recorded a pair of season-high 6-game hittingstreaks, from 5/29-6/4 (.375) and from 8/10-8/15(.455)...on 7/29 vs Phi tied his career high with5rbi, including his first career grand slam (off PaulAbbott)...twice homered in consecutive games, on7/9-7/10 and 9/23-9/24. Helped the Marlins win the World Series by establishing career highs in games (150), HR (18), RBI (77)and slugging percentage (.443)...among all National League shortstops ranked second in homers and thirdin RBI...posted a .976 fielding percentage, fifth-highest among NL shortstops...through April hit .352, eighthbestBA in the league...hit .310 in May and took a .324 overall mark into June...was hitting .300 through 7/2but finished the season at .256 after hitting .203 in his last 72g...from 5/28-6/7 hit .419 during a season-high10-game hitting streak...finished the regular season hitting safely in 9-11g...started all 17 of Fla's post-seasongames and produced one of the most dramatic homers in World Series history...his 12th-inning shot off JeffWeaver in Game 4 was the first walkoff homer in Marlins post-season history and the 13th in World Seriesannals...became only the third player whose first career playoff homer was a World Series game-ender, joiningDusty Rhodes (of the 1954 New York Giants vs Cle) and Eddie Matthews (of the 1957 Milwaukee Braves vsNYY)...he became the third player to hit a walk-off home run against the Yankees in World Series play, joiningMatthews and Bill Mazeroski, who connected for his famous Game 7 homer for the Pirates in 1960. Missed most of the season with a dislocated left shoulder that eventually required surgery...didn't playafter 5/18 at SF, when he suffered the injury diving for a ground ball hit in the hole by Barry Bonds...on 7/23,following a 5-game rehabilitation stint, had surgery to repair the torn labrum in his non-throwing shoulder (Dr.James Andrews)....at the time of his injury ranked fourth among all National League shortstops with a .983fielding percentage (3e, 188tc)...from 4/21-4/26 collected an RBI in a career-best 6 straight games (7rbi). For the Marlins led all Major League shortstops with 26 errors, 1 shy of the club record he establishedin 1999...from 7/6-7/21 tied his career-high with a 13-game hitting streak (.358, 3hr, 12rbi)...on 7/13-7/14produced 3 homers in a span of 5 at bats...on 7/13 vs NYY hit a 2-run HR off Ted Lilly and a solo HR offRamiro Mendoza...the next day homered off Roger Clemens. In an injury-plagued season appeared in only 109g...from 7/28-8/31 missed 31g while on the disabledlist with a sprained medial collateral ligament in his left knee...put together a career-high 13-game hittingstreak that included a 6-game stretch before the injury and a 7-game streak after the injury (7/21-9/8, .333)...on 6/20 vs Mil produced his first career 2-homer game...on 6/14 at Phi recorded 5rbi, a career high, alongwith 2 doubles and a triple...in July hit safely in 14 of his 16 apps (.317). Led all National League rookies in hits (155), runs (81), multi-hit games (46) and triples (8)...rankedsecond among NL rookies in total bases (241), extra-base hits (50) and slugging percentage (.430) and T3rdin HR (14) and doubles (28)...became only the second rookie shortstop ever named to the National LeagueAll-Star team (Pit's Frankie Zak, 1944)...was the only unanimous selection to TOPPS' All-Star Rookie Teamand finished fifth in BBWAA Rookie of the Year voting...was named Novato Latino Mas Destacado (MostValuable Latin Rookie) at the Latin Sports Awards...also was named to Baseball Digest's All-Rookie Team...on 11/7 suffered a hairline fracture of his left forearm when he was hit by a pitch in a Winter League game inCaracas, VZ...was in a cast until 12/6 and wore a removable splint for another 2 weeks. Spent most of the season with Triple-A Charlotte before earning his first call-up to majors August 25...made his major league debut with the Marlins that night at St. Louis, making the start at shortstop...his first game featured his first major league homer (also his first major league hit), an 8th-inning blast off Donovan Osborne in his 4th big-league at-bat...had 3 hits and 3 RBI in his 4th game August 28 at Cincinnati...on September 26 in Game 2 of a doubleheader vs. Philadelphia, connected for Florida's only walk-off homer of the season when he broke a scoreless game with a one-out, solo shot in the bottom of the 13th inning...overall, batted .151 with 3 homers and 7 RBI in 25 games with the Marlins...with Charlotte, hit .277 with 20 doubles, 10 triples and 10 homers in 108 games and was named the top major league prospect in the International League by Baseball America in a vote by league managers at the end of the season...was the International League's Player of the Week from June 8-14 after hitting .531 (17-for-32) with 2 homers, 7 RBI and an .813 slugging percentage...highlighted his week by hitting for the cycle June 13 vs. Columbus. Was an Eastern League post-season All-Star after batting .254 with 16 doubles, 19 homers and 65 RBI in helping Portland to the Eastern League Championship Series...started the season at Double-A, making the jump after only 21 games on the Single-A level...selected by league managers in Baseball America's Tools of the Trade as the Best Defensive Shortstop in the Eastern League...named the No. 4 prospect in the Eastern League by Baseball America following a vote of league managers...smashed 3 homes with 6 RBI May 24 vs. New Britain...at the time, the 3 homers were more than he totaled in his previous 2 minor league seasons combined. Split the season between the Gulf Coast Marlins, Single-A Kane County and Double-A Portland...began on the D.L. with a left shoulder subluxation and missed more than 3 months after undergoing surgery...made a rehab appearance with the Gulf Coast club, batting .390 (16-for-41) before his August 17 activation to Kane County...was soon promoted to Portland but ended the season on the D.L. with a strained right thumb. In his first minor league season in the United States, finished 10th in the Gulf Coast League with a .294 batting average...hit his only 2 homers of the 1995 and 1996 campaigns in the same game, slugging a pair of homers with 5 RBI August 12 vs. the Mets...was promoted to Single-A Brevard County to conclude his campaign. Spent his first professional season with the Dominican Summer League Marlins, batting .238 with 9 doubles, 5 triples, 4 homers and 39 RBI in 66 games. November 4, 2014 SS Alex Gonzalez assigned to Leones del Caracas. April 20, 2014 Detroit Tigers released SS Alex Gonzalez. 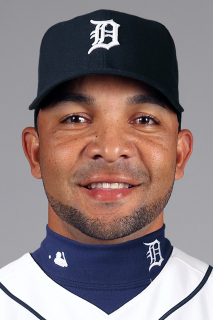 March 25, 2014 Detroit Tigers selected the contract of SS Alex Gonzalez from Toledo Mud Hens. March 24, 2014 Detroit Tigers traded 2B Steve Lombardozzi to Baltimore Orioles for SS Alex Gonzalez. March 24, 2014 SS Alex Gonzalez assigned to Toledo Mud Hens. January 31, 2014 Baltimore Orioles signed free agent SS Alex Gonzalez to a minor league contract and invited him to spring training. June 3, 2013 Milwaukee Brewers released 1B Alex Gonzalez. February 6, 2013 Milwaukee Brewers signed free agent 1B Alex Gonzalez. November 3, 2012 SS Alex Gonzalez elected free agency. October 29, 2012 Milwaukee Brewers activated SS Alex Gonzalez from the 60-day disabled list. October 11, 2012 SS Alex Gonzalez assigned to Leones del Caracas. May 23, 2012 Milwaukee Brewers transferred SS Alex Gonzalez from the 15-day disabled list to the 60-day disabled list. May 6, 2012 Milwaukee Brewers placed SS Alex Gonzalez on the 15-day disabled list. Right knee injury. April 17, 2012 Milwaukee Brewers activated SS Alex Gonzalez from the paternity list. December 12, 2011 Milwaukee Brewers signed free agent Alex Gonzalez. October 30, 2011 SS Alex Gonzalez elected free agency. July 14, 2010 Dunedin Blue Jays Traded SS Tyler Pastornicky to Mississippi Braves; Atlanta Braves Traded LHP Jo-Jo Reyes and SS Yunel Escobar to Toronto Blue Jays; Toronto Blue Jays Traded SS Alex Gonzalez to Atlanta Braves and New Hampshire Fisher Cats Traded LHP Tim Collins to Mississippi Braves. November 26, 2009 Toronto Blue Jays signed free agent Alex Gonzalez. November 9, 2009 SS Alex Gonzalez elected free agency. October 7, 2009 SS Alex Gonzalez assigned to Leones del Caracas. August 15, 2009 Boston Red Sox activated SS Alex Gonzalez. August 14, 2009 Cincinnati Reds Traded SS Alex Gonzalez to Boston Red Sox and Salem Red Sox Traded SS Kristopher Negron to Sarasota Reds. July 24, 2009 Alex Gonzalez roster status changed by Cincinnati Reds. July 19, 2009 sent SS Alex Gonzalez on a rehab assignment to Louisville Bats. June 20, 2009 Cincinnati Reds placed SS Alex Gonzalez on the 15-day disabled list retroactive to June 19, 2009. Bone chips in his right elbow.